We are currently playing AD&D 2nd edition that has been moderately house-ruled. It is taking place in my own homebrew setting of Eldritch Empires. We play every other Sunday running from roughly 12 PM until between 5 and 6 PM. 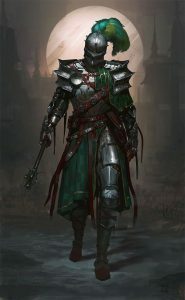 Below are the bios of the current characters followed by the bios of any deceased PCs and then the important NPCs to date and finally a synopsis of the campaign so far. They will be updated as the campaign continues on and will be noted as such. Description – Nim is petite and has a wild mane of green hair and has pale green eyes. She often wears little more than clothing made of woven grass, leaves and mud. She is rarely seen without her bow and a scimitar at her side. Nim is calm and quiet though she speaks up if she feels that something needs to be said. Background – Nim had a fairly normal elven childhood in her homeland of Duania, despite her mother telling her that her father was dead and otherwise never speaking of him which Nim always thought was odd. She developed a friendship with another young female elf named Eleriel who was as a sister to Nim. Her mother was away a lot once Nim became older due to her duties as a Whisperstrike Ranger – one of the elite protective forces of Duania. Nim followed in her mother’s footsteps initially which made her mother proud though she had never prodded her daughter to follow her example, but rather to make up her own mind as to what she wanted to do with her life. Nim would never have begun her ranger training had her uncle Kevos not noticed her aptitude with the bow. She managed to impress Kevos enough to get his recommendation when she hunted and felled an ornery paranoid stag who had eluded him and many other hunters. As she trained to become a ranger she only heard nature’s calling through her training, so it was that Druidism was not something that initially came to her, but rather something she sought for herself. 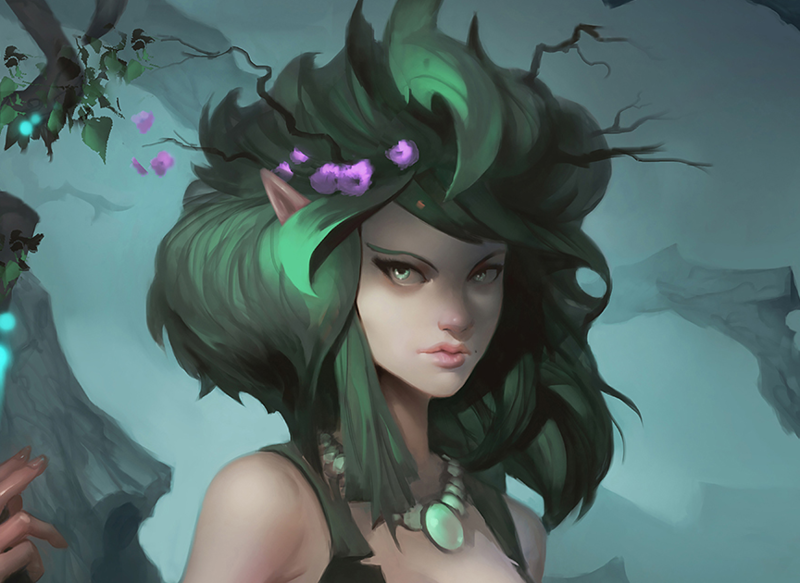 Her best friend Eleriel heard a calling to the Circles of Duania however and due to the secretive nature of the druids, she had little time for those outside of the Circle, including Nim. Nim decided to volunteer to the Circle in order to spend more time with the sister of her heart which initially got her rejected from service to the Circles. Initially she did not hear nature’s call, that is until she fought to prove herself to the Circle. She ventured into the Marsh of the Fallen in order to study the life there and in a moment of peace deep in the wetlands she heard Solonor’s voice and the whispers of the spirits of nature all around her. She had found her true calling at last. Nim was then assigned to the nearby Marsh of the Fallen along with Eleriel and she felt at home there as the life of the swamp had worked its way into her soul. While she loved the forest, she knew that Duania had plenty of protectors and the marsh had very few. She burned with the desire to cleanse the undead plague that rotted within the heart of the marsh or at least strengthen it against the corruption. After some time with the Circle in the marsh, tragedy struck when the portal at the heart of the stone circle that the druids protected expanded and then contracted suddenly due to a disruption from Nexara’s weakening and Eleriel lost her life as a result. She had been hand picked to go to a nearby Drakenblade Compound to gain training as an adventurer. Nim was sent in her place instead. 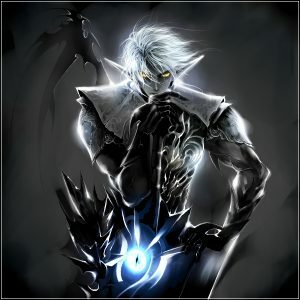 Description – Moroh has the light blue skin of the shadow elves that live within the Blackshade Forest, white hair which he keeps short and spiked, and violet colored eyes. He wears dark colored robes and carries a bone-white staff with a purplish Eldritch Crystal affixed to the top. Background – Moroh’s childhood was never going to be normal, being born as a Shadow Elf. 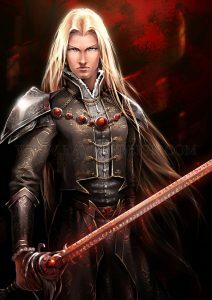 He was the younger of twin brothers and the son of one of the leaders of the assassin’s guild known as the Wraith Blades and a moderately ranked necromancer. His father tried to drown him for failing a simple task at one point when he was a child and he was never able to measure up to his brother Milinthos. He made his first kill at the tender elven age of 80 and was inducted into his father’s guild shortly thereafter despite his father’s protestations. His first task was to assassinate a crystal elf with a minor noble title. It would be a test of his ability to infiltrate and eliminate a potential threat. He found his target easily enough and was able to get within striking range. Little did Moroh know that the noble had a half-elf daughter who was a priestess of Sythari, the goddess of death who is know to abhor undead which the shadow elves were known to traffic with. When he moved to make his fatal strike, the priestess interjected and put herself bodily between Moroh and his target. Her selflessness and willingness to sacrifice herself surprised Moroh who had never seen such an act among his own people. Unable to finish his mission he fled both the crystal elf nation and his own home. Months later he found himself in the temple of Sythari in Telreth where the half-elf priestess had her home. He subjected himself to Sythari’s mercy and asked to be redeemed of his crimes and to atone for the darkness of his people. In turn they sent him to an Adventurer’s Guild where he began preliminary training as a mage in order to rid himself of his reliance upon his assassin training. After running a mission with a newfound group of adventurers he left for a short while to answer a call from the Nation of Celini where he underwent an official Returning – a magical ritual that will allow him to be considered a crystal elf when he fully atones for his misdeeds. Now he travels with his companions hoping to find redemption for not only himself, but eventually for his brother as well. Description – Bran has strawberry blonde hair and gray eyes. 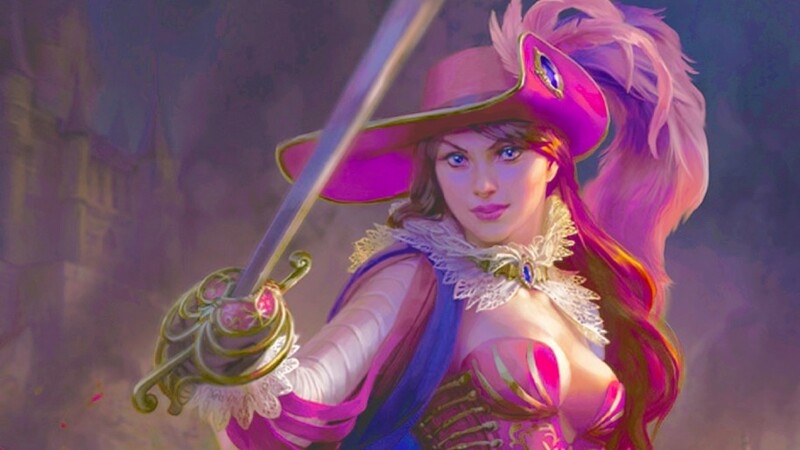 She often wears brightly colored clothes with a flamboyant style to them, usually in purples and teals. At times she can be seen wearing the black and silver tabard of the Musketeers and a wide brimmed hat of the same color with a feather of bronze coloration marking her as a junior member of the order. Background – Bran was born to a branch of the prestigious Deepstrider family that made its home in the Free Cities of Mir, plying the trade of merchants. She had a normal childhood and when she was a bit older her parents moved her back to the steam dwarven homeland of Karjith-tyr in order to resupply and renew their mercantile licenses with their clan. While there she began training as a dwarven warrior, learning blade and thunderclub. It is also while in her natural homeland that she found a love for tinkering and steamtech. She decided however that she missed Mir and the friends she had made there. When she returned she reconnected to some of her previous friends, including one that got her involved with the thieves guild known as the Black Coin due to her technological devices which aided in the “trade”. She became part of the Moonrise Band who operated under the Nightmaster of the guild. She found that the Nightmaster, a despicable human by the name of Francois, rubbed her the wrong way. After a time of watching him abuse the younger members of the guild and taking far more than his normal cut of their take, she had had enough and eliminated him. Poised to take his place, Bran found out that one of the members of the Moonrise Band was also a member of the Musketeers, a band of outlaws who once saw to the safety and protection of the citizens of Mir. Bran joined their ranks and one evening came across a girl who was on the run from a constable. Bran protected the girl who claimed that she had watched the constable kill an innocent man in an alleyway. Unfortunately for her troubles Bran was arrested. She broke herself out of prison and became a fugitive. The Musketeers aided her in escaping the city and informed her that she should travel a broad for a while until the whole thing blew over. Description – Lewis is a young human male at only sixteen years old. Despite the young age, he is a very large human at 5’11” with an athletic, broad-shouldered build. He has a broad face with dense eyebrows. He keeps his light brown hair cut to his shoulders and he has grey eyes. He wears his clothing, either a basic traveler’s outfit or his knight’s colors under his armor, which is always polished to a high silvery shine as with all Silver Knights. He wields either a mace or lance. Description – Raven is a young half-elf in terms of both humans and especially elves. She is slightly shorter than average and is slim and athletic. She has black hair and ice blue eyes. 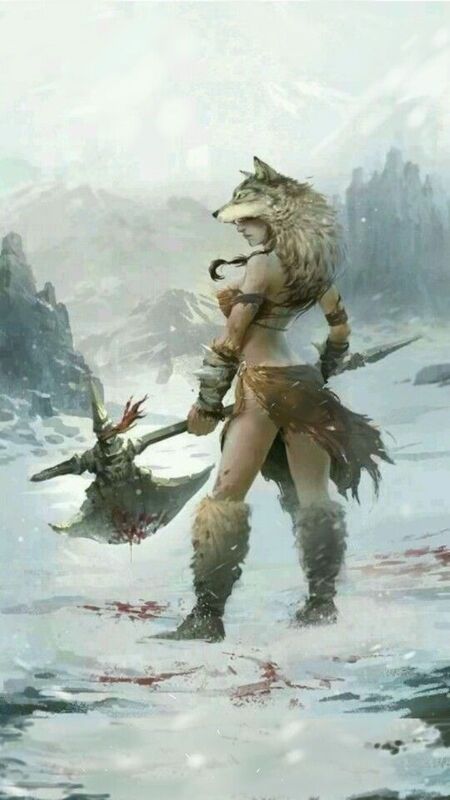 She wears furs and leathers of her homeland and is never seen far from a huge two-handed axe. She was marked by a wolf bite to her arm when she was young and she has a tattoo of her tribe on her cheek. Background – Raven is of the Blizzard Barbarian tribes of the Maerrheim region. She was the child of a crystal elf slave who escaped from the Maerrheimians and the chief of one of the tribes. She also claims Snow of the Blizzard’s Fury as her half-sister. Her mother was re-captured and killed by the Maerrhiemians shortly after her birth, but luckily she was with her father’s people when that happened. She grew up idolizing her half-sister who had no problems training her and eventually being a reference for Raven to join the Adventurer’s Guild when Raven wanted to run away from an arranged marriage between herself and the prince of a rival tribe. She went to the Adventurer’s Guild and would become one of the first members of the adventuring company. Through a quirk of fate, Raven ended up drinking a philter of love and falling for Malik, but eventually those feelings would become real rather than magically induced. Death – After an excursion into a lost druid ring, the company found a powerful artifact carved out of a corrupted Eldritch Crystal. They traveled to the land of Duania in order to deliver the crystal to an Archdruid who could make the crystal safe again. On the way there they were pursued by dark forces and as they made it to the borders of the Duanian forests, the terror driving those forces showed itself – a skeletal dragon that showed a an unmatched and unholy malevolence. A creature like this was only rumor before now and as it caught up with the adventurers it seemed to be making a direct line for Malik. Seeing this Raven threw herself in the path of the raging dracolich and sacrificed herself to see that her beloved lived through the day. Description – Tanithil has dark blonde hair with green highlights and green eyes. He keeps his head shaved with the exception of a single ponytail. His head has several Duanian tattoos on it and he rarely wears more than hides so he can show off the temporary tattoos made from various dyes upon his person. He carries a two-handed sword, two longswords and a bow. Background – Tanithil grew up as an only child in a primitive wood elf settlement on the outskirts of Duania. This particular group of wood elves shunned the trappings of civilization and society that the Duanian elves had started to embrace, though they remained loyal to the Circle. They were even more disgusted when they welcomed humans into their fold and began to breed with them and train them in Druidism. Tanithil’s family was looked upon with suspicion in his camp due to their familial connections with the more civilized Duanian elves. In fact Tanithil’s aunt – father’s sister in law was a protector of the Duanian way of life. As such Tanithil didn’t have any childhood friends or playmates. Instead he would play with the animals of the forest, despite them running away when he would play too rough. Close to his coming of age Tanithil came across a human poacher hunting dire wolves which are protected by Duanian law. The poacher had managed to kill a mother in her den and when Tanithil saw the poacher about to kill her pups, he became enraged and killed the hunter with his bare hands. He befriended the pups and they followed him as they would a pack leader. For Tanithil’s part he found that he seemed to have a natural rapport with the wolves and this ability would grow in time. Seeing his natural talents with the animals his parents sent him to the Duanian Circle, feeling that he might have the calling to be a Druid. They were wrong. His connection seemed to be only with the wolves. The Circle instead had him trained as a wolf rider amongst the Woad Champions. As the wolves got older, the male wolf that Tanithil had originally bonded the strongest with died after being injured while hunting. The female pup then took the male’s place and she grew into his companion and carried him on patrols and into battle. With the recent happenings in Duania, he has been asked by the Circle to travel with his cousin Nim without knowing the fate of his family or camp. Description – Malik has dusky skin common to the desert peoples of Araz and black skin and dark brown eyes that are dark enough to seem black. He has three facial scars on his right cheek that cross his lip. He wears dark leather armor covered by a light grey tabard with his master’s sigil on the front and a tan military coat. The most prominent feature is the collar that he wears that seems to be magically grafted to him with no way to remove it. He is often seen with a scimitar on one hip and two short swords sheathed across his lower back. Malik is quiet and demure, given his station as a slave in his homeland. Background – Malik was born to a family in Araz that already had seven other children. His father was a stonemason and his mother a handmaiden to a Sultana. His father failed a job for a powerful man named Ghasson that made him look foolish in front of the Sultans. this caused his father to owe Ghasson a huge debt. In payment for his failure he sold Malik to Ghasson. 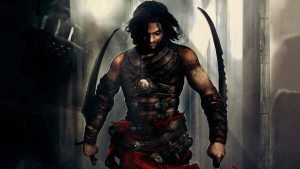 At fourteen it was discovered that Malik had a natural talent for the blade when he took up a fallen Mamluk’s sword and defended Ghasson. Ghasson was even more thrilled when he learned that Malik might have a talent for the arcane and he immediately inducted him to the Academy of the Djinn to be trained as an Arcaneblade. With his unique talents and fierce loyalty to Ghasson, he is often sent abroad in order to “retrieve” treasures for his master. He was recently sent to a Drakenblade Compound near Kyrador to learn the ways of the adventurer, as Ghasson felt that the training would only heighten Malik’s already considerable abilities. Death – While in another realm, aiding a people oppressed by the powerful vampire lord Strahd von Zarovich, Malik met his end facing off with Strahd himself. Luckily he died due to his wounds rather than the vampire’s ability to drain the life from his victims which meant that Malik would not rise as a vampire. Despite this great loss in the Company of the Snow Raven, Malik’s death was as just as heroic as that of his beloved Raven. Description – Lyra is a stunningly beautiful half-elf with long flowing blonde hair and bright light violet colored eyes. She wears tight, form-fitting leathers and is never seen without her very ornate (and highly enchanted) platinum flute and steelpine lute. Background – Not much is known about Lyra Treesong except that she belongs to a secretive organization that spreads news and information regarding the forces of evil throughout Ki’rous. At one time that meant keeping an eye on the movements of the Cult of Nexara, but now it seems that she and her order follow and report on the movements of any evil force that grows too powerful. She seems to guide adventuring companies to be at the right place at the right time in an almost serendipitous manner, and some think she may have guidance from a very powerful source. Description – Caladaer has light blonde hair and bright violet eyes. He wears a suit of elven chainmail that he inherited from his mother and wields a single elven warblade. He otherwise favors loose tunics and leather pants. His tunics tend to be bright, vibrant colors and he often accompanies them with equally bright colored scarves, cloaks and wide-brimmed hats (a style he picked up from a training adventurer from Mir who was drummed out of the guild early on). Background – Caladaer, also called Cal by those close to him, is a handsome half-elf bladesinger (fighter/mage) who is currently training at Deepstrider Camp. He learned his fighting style from his crystal elven mother and is very adept and his magic seems to come very naturally to him. Due to his natural talents, he has been singled out by Rela as a teacher’s assistant. He is an easy going individual who always seems to see the silver lining in every situation. Due to his upbringing being raised by and elf and a human in Aerinvale, he has a very open mind and is not quick to judge individuals which has endeared him to everyone he meets. He is kind, friendly and optimistic but can be a little rash and unwise at times. 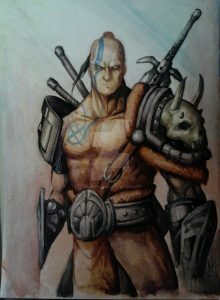 The adventuring company that would come to be known as the Company of the Snow Raven began simply enough – after they were trained at the Drakenblade Compound of Deepstrider Keep, named after Kordan Deepstrider of Drakenblade fame, they would travel into the Orcrage Hills and clear out a small lair of goblins led by an orc. They were successful only to find out that it was merely an illusion – a test set up by the heads of the compound. After they passed this test, they would be given their first real assignment; to investigate an old druid circle, recently rediscovered by shepherds that traveled through the area on a regular basis. One such shepherd, the cousin to Rela Elkhorn, the commander of Deepstrider Keep had gone missing at the circle. The company went to the circle and found one of the stones had fallen over, revealing a hole that led into an underground complex underneath. As the company explored the complex they would come to learn that it was not uninhabited. Nightmarish creatures and traps littered the compound and part of it had been taken over by spider-like creatures called chitines. They did find Lady Elkhorn’s cousin, who was dead in one of the traps. They eventually discovered that the compound was once the home and laboratory of a powerful mage who once advised the last Platinum Emperor, Wareth who brought about the Sundering. On the lowest level of the compound they found more nightmares and traps as well as the leader of the chitine community who had found and awakened an artifact of great power – a corrupted Eldritch Crystal that pulsed with unholy power. They managed to defeat the chitine lord and shut down the power of the artifact. When they returned with the artifact, they were told to take it to Duania where the druids would know how to handle the dark Eldritch Crystal. They agreed and set off on their trek. They would be hounded by evil forces the entire way to Duania and one of their number, Raven, would be cut down by a dracolich in an attempt to save her fellow company member Malik. Despite their loss, they would take the crystal to an Archdruid, who turned out to be an agent of some evil lord. He took the crystal and used its power to open a portal that led to a barren, blasted and dark land filled with undead. The undead poured forth and the darkness from the portal began to spread across the land. The company fought their way free and traversed the now dark and evil forest to the principal city of Duan-Meris where the remainder of the Duanian people had fled to. They fought a constant retreating battle until they cleared the forest. Bereft of home and hope, the Duanian peoples looked first to Kyrador for aid. Kyrador could not provide that aid as they were stretched thin as it was since they were preparing to march half a continent away to Shadestone in order to lay siege upon that dark reflection of their own kingdom. Duania would have to look elsewhere. They would send the company, which would now include Nim’s cousin Tanithil, to the elvish nation of Safonia in order to find a place for the refugees to go. On the way to the elven nation, they would be waylaid by undead along the way. A young friar named Lena Bearguard would aid them and then inform them that she was after a thief who made off with a forbidden tome from her monastery. They would volunteer to aid her and traveled into the Marsh of the Fallen where the thief had gone. They found the thief, an evil dragonborn priestess of Tiamat handing the tome to a hatchling black dragon. They would defeat to duo and their black-scale kobolds only to find that the tome detailed ways to awaken the Dragon Emperors. Lena took the tome and headed back to her monastery. The company would eventually get back on track and reach the elven lands and were met with the border patrol who allowed them in. Once within the city of Safonia they would find themselves accused of bringing undead to the magical shield-wall of Safonia, and bringing evil with them. Especially since they traveled with a shadow elf. They would be imprisoned and offered a chance to free themselves and help the people of Duania. They only had to clear out a keep that had been taken over by a force of gnolls and bugbears that seemed to be working together. They would be successful and find that the humanoids were led by a human cleric of Xarkathil the evil god of tyranny and fear and also the head of the Tribunal of Darkness. They would also find a holy symbol upon the cleric’s body that no one recognized and as he died her would spout a dark prophecy. When they returned, they were welcomed as heroes and their sentence would be commuted. Safonia would also allow the Duanian refugees to seek shelter under the boughs of the Safonian trees. While resting, the company would be joined by a new company member, Branriel of Mir. They would also hear dark rumors coming from the Republic of Telreth. Apparently the temples had finally taken over and were moving troops into Shadestone. Freely. It seemed that for some inexplicable reason that Telreth was reinforcing Shadestone from the incoming Kyradorian attack. As the company left Safonia to look into these rumors, a thick and malevolent fog would move in the first night of their travels. After the mist cleared Bran was missing and they found themselves in an unfamiliar forest and upon an unfamiliar world. Tanithil’s trusty wolf companion would begin to act strangely and leave the company. They eventually found themselves at a roadside inn where a mysterious man would approach them with a letter. They would find that the letter was a plea for help from the local burgomeister. The company resolved to travel to the nearby village of Barovia to offer their aid. On the way there they would come across a body within the forest with another letter grippe din its hands, an older one but essentially saying the same thing with one important detail added – that a vampire was victimizing the daughter of the burgomeister. They would also find a caravan encamped on a riverbank with colorful tents and music and food aplenty. There they met with the elder of the caravan who gave them a fortune reading, presaging items of power that would aid them while they were in this dark land of Barovia as well as a clash with a dark force. The company would eventually make it to the village and while at the inn they would find the son of the burgomeister who would explain that the second letter was actually the one from his father. When the company retired for the night Tanithil’s hatred of the Moroh would come to fore and the Dark Powers that controlled the land would take over Tanithil, offering him power if only he would give into the hatred. And give in he would. After trying to outright murder his companion Tanithil was warped beyond recognition and ran away. The company would give chase but Tanithil wold eventually make his escape. Nim tried in vain to find him but would fail. Afterwards they would visit the burgomeister’s home and give him a proper burial. They would also be joined by his daughter, Ireena who wanted to make sure that she would no longer be victimized by the dark lord of the Barovia. They also heard of a great symbol of holy power that was stolen from Ireena’s home. The company would then make their way to the castle Ravenloft where the lord, Strahd von Zarovich, could be found. Along the way they would find a Silver Knight of Kyrador who had somehow found his way through the Mist. With their new companion they went to the castle to confront it’s lord. And confront him they did but not without great cost. They found that Strahd was indeed a vampire and as they traversed the castle they found it to be a palace of horrors, from a living tower to the undead that ran rampant throughout, to the master vampire himself. They would find the means of his destruction as well as his crypt. They fought him and he looked poised for victory, especially after Strahd killed Malik, but they prevailed and found his coffin where they seemingly destroyed him for good. They would find out that Ireena was who she said she was but that she was also Kolyana, who was the love of Sergei von Zarovich, the brother of Strahd. Strahd grew jealous of Sergei and Kolyana’s love and tried to take her for himself. Apparently they had played through this cycle many times before. But for now Strahd had been vanquished and they could leave these dark lands behind them. But the Mists don’t reach entirely into Ki’rous, but instead into that dark reflection of the world they had seen through the portal, and that is where they ended up. They found Bran there who had been surviving there for a few days. From there they figured out that they were in Safonia, just a dark mirror of that land. They traveled to the city, led by the beacon of a holy symbol that kept the undead at bay while in the knight’s hands. They found that the city was filled with undead, all going about their daily “lives” as if they were living in the city itself. At the top of the wizard’s tower they found a portal that was not fully open yet. They could also see the mountains to the south east. When they cast their gazes to those mountains, they had a mental image of rushing towards those mountains to see a huge humanoid being sitting upon a throne, chains binding its faceless form to the throne so tightly that the chains cut into his flesh causing him to bleed endlessly. He informed them in their minds that he planned to take Ki’rous for himself, that his dark lands would spread across their plane of existence and take over. They went through the portal and the holy light of the icon that the knight carried shattered the portal as he stepped through.